When I worked in Medical Research, there were no time cards or timesheets. They were for the nursing staff and the medicos, who had to clock on and off each day just inside their entrances to the hospital. But in our laboratory the staff had no such requirement. When I commenced in an agency as a junior copywriter, I was surprised to be asked to keep a timesheet weekly, especially as I was only working on one client – Myer. 100% of my time was committed to that account and yet I was required to keep a timesheet on the hours I spent in briefing meetings, presentation meetings, production meetings and even time developing ideas, headlines and scripts for weekly press and radio advertising. But over the 15 years I was working in agencies, I was required to keep a timesheet for my time which was used to either bill the client or justified the amount billed to the client. Here are some of the flaws I noted in the various ways this was applied within agencies. There are many systems available now, but within agencies there are usually not the type of time keeping systems such as you find in a legal or accounting practices. Most of the systems I was required to use were paper based or e-mail. There were also no minimum increments. I chose 30 minute increments as most meetings were multiples of an hour, while most tasks were 20 – 30 minutes. But I remember seeing the EA to the Head of Client Services at one agency I worked using 8 hour increments. That is they allocated a day a week to the five largest clients. Or the account director who had half their time allocated to one client and the other half to another and simply applied half day increments in the hope it would add up to 50 / 50. I discovered fairly early in my agency career that deep in the bowels of the Finance department there was a report that reviewed the billable hours per staff resource. It appears that the account teams were always at the top of this list with their timesheet keeping described above. But the creative and production people were often at the bottom because they found it difficult to find 8 billable hours a day to bill the various clients across the various tasks. In fact I wish I had kept the memo that informed us that billable hours would be considered as part of our performance bonus. At one agency I made a concerted effort and was rewarded by the agency CFO informing me I had the highest billable recovery of any creative person in the agency. Timesheets were not always completed on the day. In some agencies they were collected weekly and other monthly. I used my diary to record meetings and then fill in tasks and time in the margins. I would use this to complete the timesheet daily or every few days, rather than having the rush at the end of the week. I also started to make it a habit to keep copies of my timesheet for my art director, who under threat of not being paid unless he completed the past month of timesheets, would come to me for inspiration and literally copy my timesheets as his own. It seemed that it did not matter how accurate or consistent the process was, as long as it was completed. If I was sitting in an internal WIP meeting where we were covering the half a dozen clients that I was working on, where would I allocate this in the timesheet? Was I to simply split the two hours equally over the six clients? Or perhaps mark it as an non-billable internal agency meeting? Or how about when I was sitting at an edit suite for hours of post-production and actually working on ideas for another client? Do I bill both times to the different clients? Under the pressure to recover our costs, it was not considered double dipping to put the same hours down for two different clients if it meant getting to the magical 100% recovery. I remember one old art director who would spend hours on their timesheets when requested of them. I asked why they took so long, was it to get it accurate? They smiled and explained to me that it was their time for revenge on the clients they did not like. The ones who made ridiculously minor changes to the work, or required multiple iterations of work before they would approve it, or were just plain difficult. What they would do is apportion their time to these clients at a much higher level than the clients they liked working with. I asked how this was punishment. Either directly (if the client was billed by the hour) or indirectly (if the client was paying a retainer) the financials would look much better for the good clients and much worse for the bad clients. 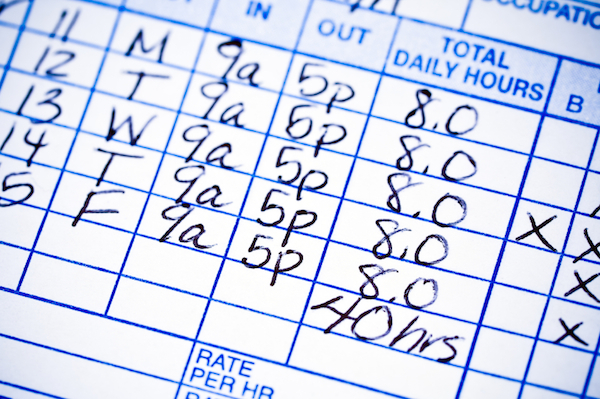 Timesheets are a great way for an agency to determine their internal resource recovery rate. But they are far too inaccurate in almost every case to be used as a basis of the agency’s remuneration. I have already spoken and written previously on the folly of using head hours for charging the cost of ideas and concepts. But the lack of rigour makes the use of timesheets to justify agency costs and charges completely flawed. This is why we favour value-based or value-priced models over the cost recovery head hour model. It is why we have been recommending both agencies and advertisers should move away from what is currently the most common model, but is also largely flawed. When advertiser and procurement professionals ask what is best practice in this space, I am forced to clarify if they mean ‘best practice’ or ‘common practice’. The retainer or resource model is the most common practice. But it is by no means the best practice. It would seem that for agency and advertiser, it is better the model they know, even if it is flawed, than to try a model that solves this issue and eliminates the need for timesheets forever from the advertising industry. What are your thoughts on this? Let me know here and add the time it takes to your timesheet as “Industry development”.